Earlier this week I received an email from the folks behind "We Reviewed Over 2,000 Brands of dog Food, Only 134 Made the Cut". They have a whole lot of marketing sunk into their page on Reviews.com, and wanted to know if I was interested in sharing their results with you readers. I kind of figured that the whole thing would have very little substance, and I was right. Though they claim to have built a list of over 11,000 people, from veterinarians to university researchers, they somehow managed to miss some glaring issues with their study. So let's start with their headline: "We Reviewed Over 2,000 Brands of Dog Food". The review includes a list of just some of the brands that didn't make the cut. Can you spot the brands that don't even make dog food? Fruitables makes a variety of dog treats, along with dietary supplements that include canned pumpkin puree. Nummy Tum-Tum also makes canned pumpkin puree. The Himalayan Dog Treat Company is also on this list. They don't make dog food either. 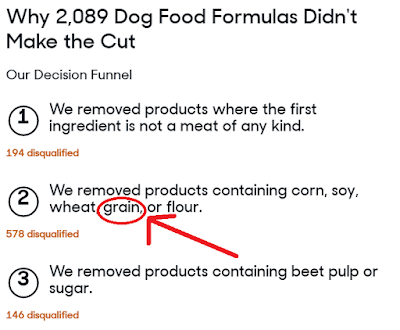 How many more of those "Over 2000 Brands of Dog Food" don't actually make dog food? What About Freeze Dried? What About Air Dried? 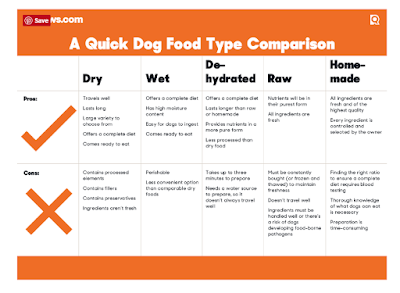 Early in the report, there is a list of dog food types. It lists pros and cons of each type, but fails to mention freeze dried or air dried foods. Freeze dried raw foods share some properties with both raw foods and dehydrated foods. They aren't perishable, but they usually need to be handled like raw meat. Likewise, air dried foods share some properties with dry food and with dehydrated food. Ignoring these two types of food just feels like lazy reporting to me. It's another way to tell that the Reviews.com researchers weren't particularly paying attention when they "exhaustively researched" all those dog foods. I'm pretty sure a lot of this "research" involved reading marketing claims and accepting them at face value. The folks at Reviews.com then went a step further and made a completely unsubstantiated claim that nutriceuticals work for joint pain. This is actually a lawsuit-worthy claim when made by a dog food company. They can say that glucosamine and chondroitin help support healthy joints, but there is not enough evidence for them to state outright that they alleviate joint pain because THEY DON'T. The evidence that glucosamine and chondroitin work is minimal, and tends to disappear in larger and better-designed studies. 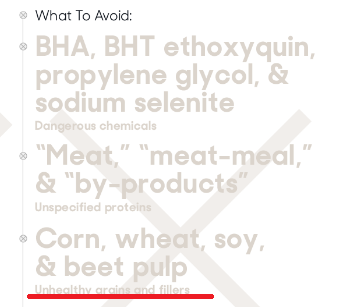 Another example of taking marketing terms at face value is the statement that unhealthy grains and "fillers" should be avoided. As Linda P. Case, author of Dog Food Logic, so helpfully pointed out in her book, there is no such thing as a "filler". Dogs need nondigestible fiber to adequately process their food, just like humans do. Some dog foods certainly contain undesirable amounts of nondigestible fiber, but they do need some in there. No matter how fancy your dog food is, there is some nondigestible fiber in there. Calling some types of fiber "fillers" is misleading when the bulk of the issue is the amount, not the ingredient. I'm not really sure why they are demonizing beet pulp in this report. They seem to be lumping it in with sugar when it's actually another source of nondigestible dietary fiber. It's actually a source of fermentable dietary fiber that has been shown to increase nutrient absorption in the digestive tract. Yay science! 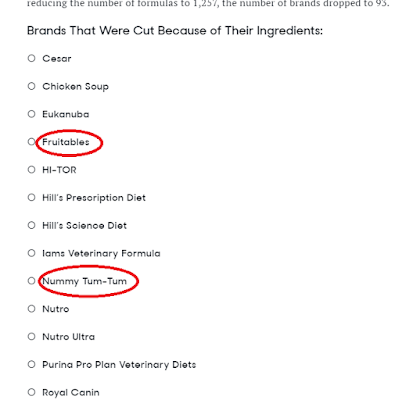 Finally, at the end of the report, Reviews.com gives their list of foods that made it through their decision funnel. Please note number 2 on the list, which states that they removed products containing grain. This seems odd to me, as dogs are indeed omnivores that can digest grains, no matter what the crazy raw feeders tell you. 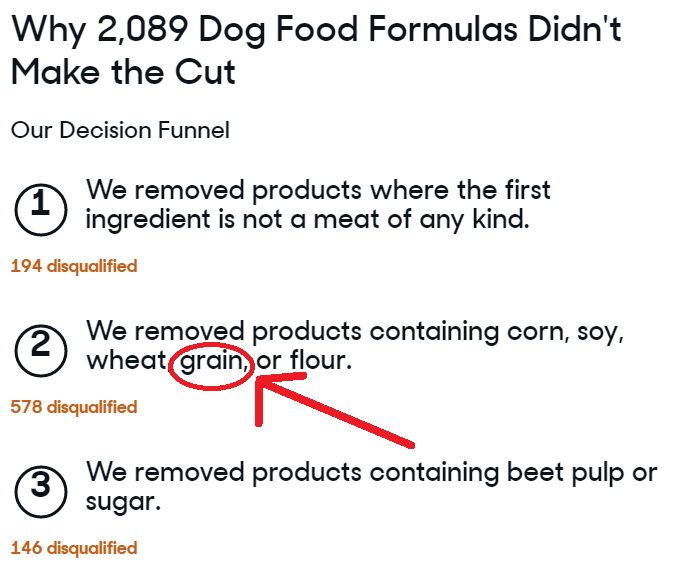 Some dogs actually do better on grain-inclusive foods, so it seems weird to cut those out entirely. This mostly just makes people feel guilty when their dog can't have a solid bowel movement on grain-free food. 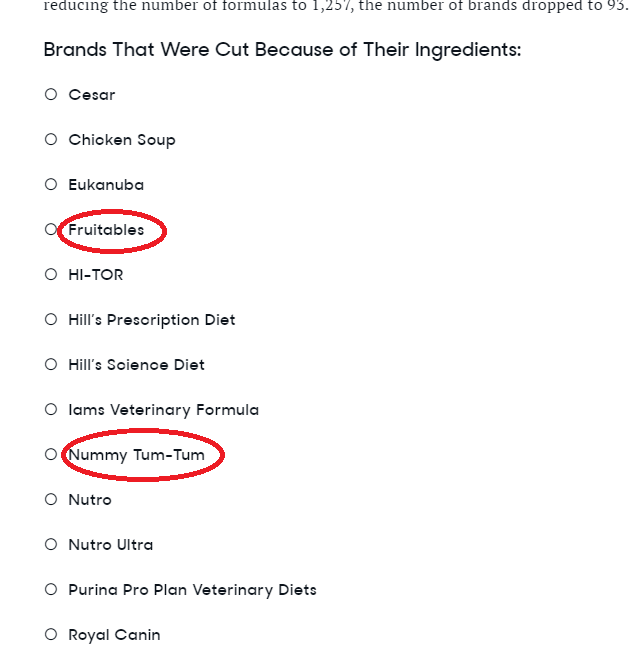 A quick glance at their list of foods that did make the cut shows that someone fucked up somewhere though, because AvoDerm's chicken and rice formulas are on the list. Did you know that rice is a grain? Apparently the Reviews.com team of exhaustive researchers didn't. Also included are Eagle Pack's canned foods, which contain barley. Did you know that barley is also a grain? How about Fromm's Four-Star Nutritionals, some of which contain rice, barley, and OATS! Oats are also a grain. So...yeah. You can go ahead and dismiss "We Reviewed Over 2,000 Brands of Dog Food" as the clickbait that it is. There is nothing new here, just incredibly lazy research and repetition (and embellishment!) of empty marketing claims. Frankly, I find it embarrassing.